Collagenofibrotic glomerulopathy was first described by Arakawa in 1979. Till now, 13 patients were reported from India in three publications. 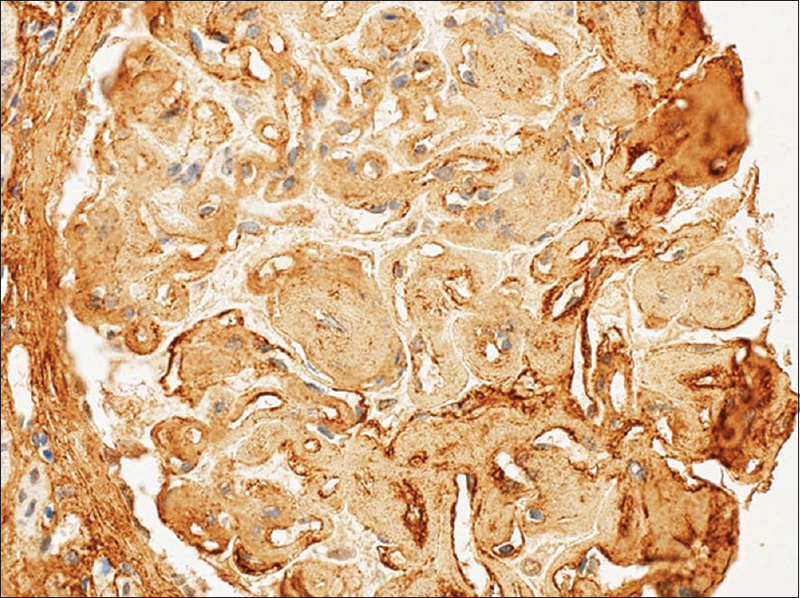 We present a patient of collagenofibrotic glomerulopathy from our institute. We also present an overview of all patients reported from India [Table 1]. A 54-year-old female had been a nondiabetic and hypertensive for the past 1 year. About 2 years ago, she had swelling of feet, facial puffiness, and abdominal distension over a period of 1 month. She was evaluated at another nephrology facility. The investigations performed then were urine albumin: 3+, urine protein-creatinine ratio: 9.5, and serum albumin: 1.9 g/dl. She then underwent a renal biopsy. There were 13 glomeruli, all were enlarged in size. There were a few pale eosinophilic acellular, weakly periodic acid–Schiff (PAS) positive material in mesangium. Similar material was found along the capillary loops. There were negative with silver stain. The Congo red stain does not show apple green birefringence. The negative Congo red confirmed even on thick section. There was no hypercellularity, necrotizing lesions, or crescents. Tubules and interstitium showed atrophy, fibrosis, or interstitial deposits. There was hyalinosis of small arterioles, tunica media hyperplasia, and no vasculitis. Immunofluorescence microscopy showed focal and segmental trapping of IgM, 1+, and C3 and trace positive in the areas of hyalinosis. C1q, IgA, IgG, C3, and fibrin were negative. It was reported as membranoproliferative glomerulonephritis. Prednisolone and angiotensin-converting enzyme inhibitors (ACEi) were given as the treatment. She presented to our institute with the history of worsening anasarca. The blood pressure was 150/100 mmHg. 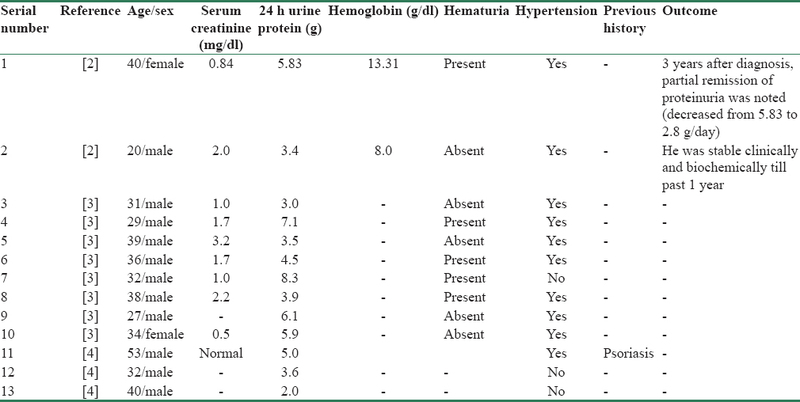 The investigations were serum creatinine: 2.3 mg/dl, blood urea: 54 mg/dl, hemoglobin: 6.3 g/dl, total serum proteins: 4.8 g/dl, serum albumin: 2.0 g/dl, and 24 h urine protein: 9.3 g. The peripheral smear revealed normocytic normochromic anemia with occasional macrocytes. She showed negative serologies for antinuclear antibody, hepatitis C, hepatitis B, and human immunodeficiency virus and had normal serum C3 and C4 levels. Antineutrophil cytoplasmic antibody serologies were negative. There was no previous family history of renal disease or signs/symptoms of nail–patella syndrome. A second renal biopsy was performed. The findings were there were ten glomeruli. 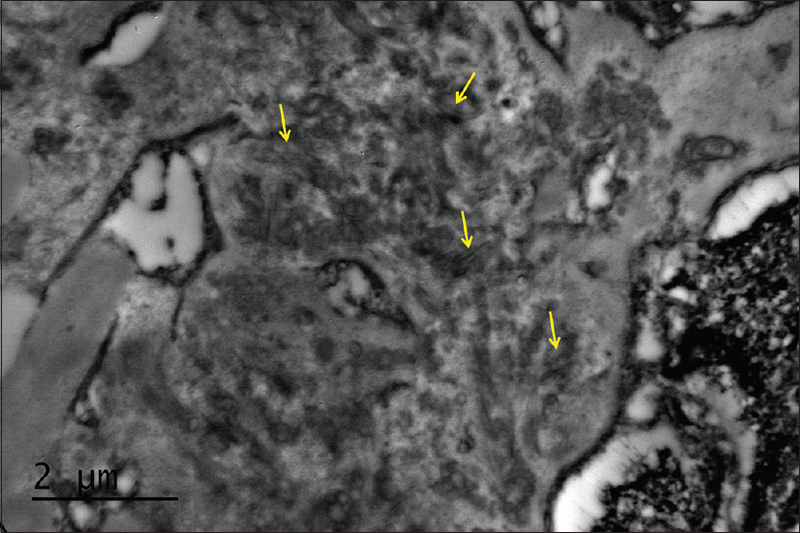 One glomerulus was globally sclerotic. The remaining were enlarged with deposition of a pale PAS and silver negative material in the mesangium in a diffuse and nodular pattern [Supplementary Figure 1] [Additional file 1] and [Supplementary Figure 2] [Additional file 2] . This material is also focally deposited over the capillary loops. It was blue on trichrome stain [Supplementary Figure 3] [Additional file 3] . The Congo red stain for amyloid was negative. The capillary loops showed double contours. There was no endocapillary proliferation, necrotizing lesions, or crescent formation. The interstitial fibrosis and tubular atrophy involved 25% of the core. Prominent arteriolar hyalinosis was present. The electron microscopy displayed the expansion of the mesangium by curvilinear bands of collagen [Figure 1]. 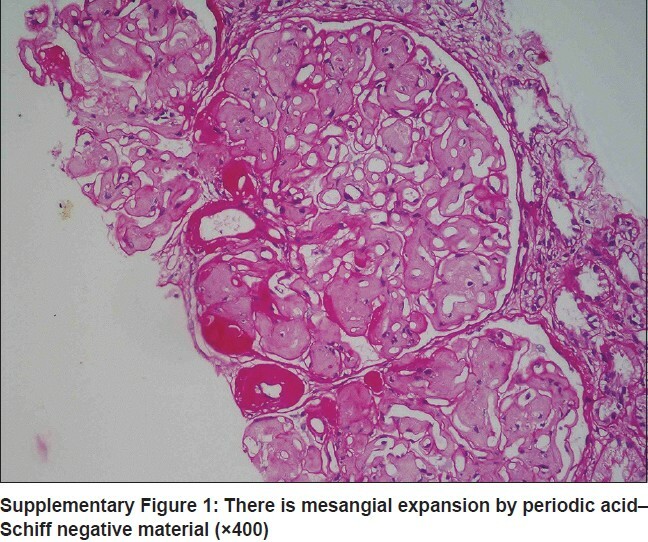 The glomerular basement membrane was globally thickened. Visceral epithelial cells show severe foot process effacement. No immune type electron dense deposit was visible. The immunoperoxidase stain for collagen III was positive [Figure 2]. She was started on prednisolone 1 mg/kg/day, ACEi, and angiotensin receptor blockers. During next 2 months, the serial serum creatinine values showed a declining trend, 2.2→ 1.9→ 1.5→ 0.9 mg/dl. 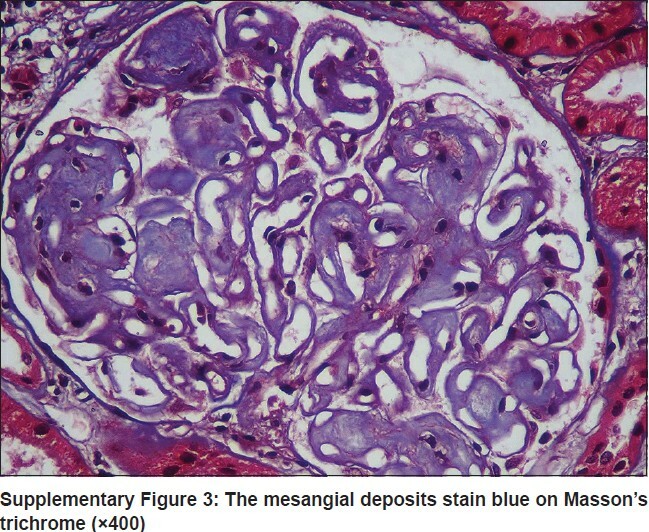 Arakawa M. Idiopathic mesangio-degenerative glomerulopathy. Jpn J Nephrol 1979;21:914-5. Patro KC, Jha R, Sahay M, Swarnalatha G. Collagenofibrotic glomerulopathy - Case report with review of literature. Indian J Nephrol 2011;21:52-5. Kurien AA, Larsen CP, Cossey LN. 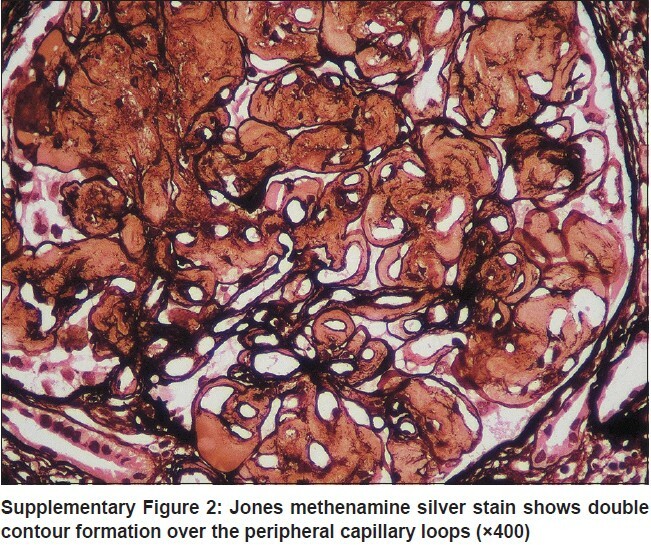 Collagenofibrotic glomerulopathy. Clin Kidney J 2015;8:543-7. Duggal R, Nada R, Rayat CS, Rane SU, Sakhuja V, Joshi K. Collagenofibrotic glomerulopathy-a review. Clin Kidney J 2012;5:7-12.